I couldn't seem to figure out a way to apply the conditional formatting to the entire column (for each cell, I seemed to need to apply it manually). WELZ, you can do this with pure conditional formatting, no helper column. Choose "Format" from the menu, then "Conditional Formatting" and finally "Add new rule." The box that says "Apply to range" will say "C1." Replace this with "C:C" instead. Under "Format cells if..." click the scroll arrow, scroll all the way to the bottom of the drop-down menu, and select "Custom formula is." The last entry of each day will be highlighted (mint green by default for now). Use the "Formatting Style" options to style as you see fit. When finished, click the blue "Done" button. Two conditions MUST be met. If you've followed the above instructions, you will have changed "C1" in the Conditional Formatting dialog box to "C:C"; this means that whatever happens to Row 1 of that range will happen to every row. So when we apply ISNUMBER() to cell A1, it will actually check A1 relative to C1, A2, relative to C2, etc. ISNUMBER(A1) is the first condition of the AND() that must be met. It will essentially check to see that you have a date (which Google Sheets sees as a formatted number) in Column A. In English, Google checks this: "Only apply any conditional formatting to the cell in Column C if the cell in Column A of the same row contains a date (i.e., don't apply any formatting if there is text, such as a header, in Column A of that row, or if Column A for that row is blank)." The second condition of the AND() that must be met is that at least one of two things must also be true. ...that next cell in Column A (below the current row, i.e., A2) must be blank (which will catch the date in the final filled row as the last entry of that day, since there are no more dates to measure it against after that, just blank rows). 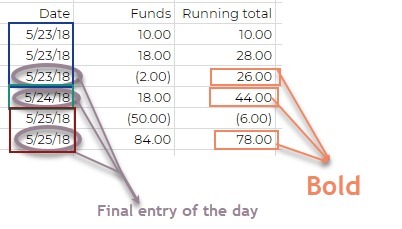 All together, in English: "Format the cell in each row of Column C if the cell in Column A of that row contains a date AND if either the cell below that date is higher or blank." Not the answer you're looking for? 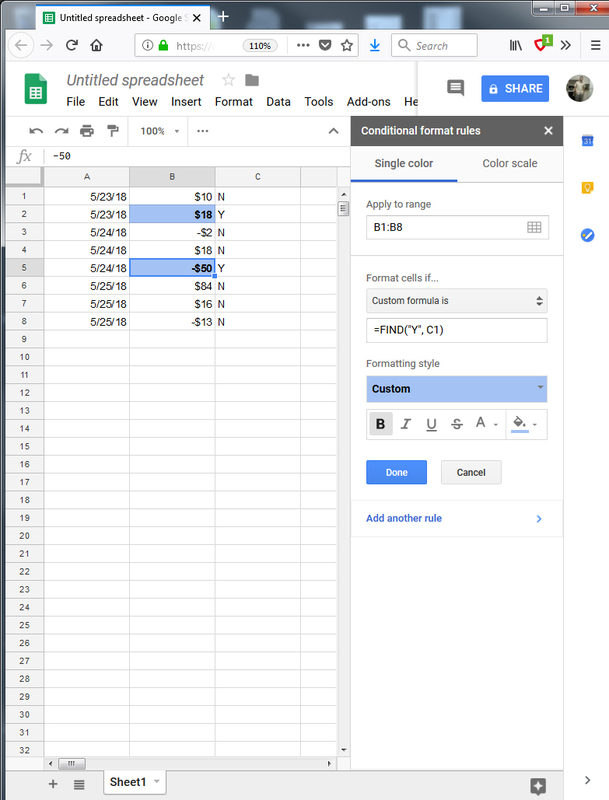 Browse other questions tagged google-sheets formulas conditional-formatting worksheet-function or ask your own question. Why can't I refer to another cell with the value comparator field?